Quadrillion is the ULTIMATE solitaire game - multi-level, single player, brain teasing fun. Start a new challenge in a snap! Just place the four magnetic grids together and start playing. 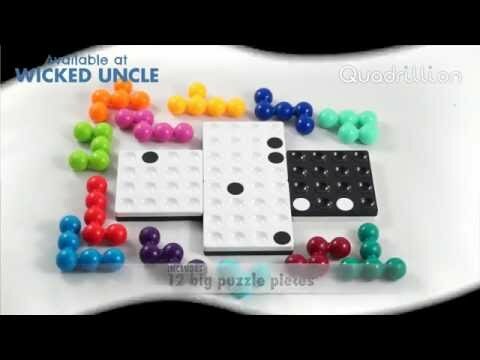 Can you fit the 12 puzzle pieces on the game board you just created without placing any puzzle pieces on top of the black or white dots? Flip, turn, place, arrange, rearrange and connect them all until the puzzle's solved. Follow the 60 challenges in the booklet or simply snap the boards together and create your own for endless fun. Perfect for whiling away the hours on a road trip and emerging a newly formed mastermind! Box Size: 4.75" x 4.75" x 2"